As we head into the 2019 season, RedRoy pays tribute to some of our most loved and most talented players who’ve decided to hang up the boots – at least for the time being. With that range of retiring talent, in the end we decided to look no further than former captain extraordinaire as the pinup boy for this story…just one more time. By Gabrielle Murphy. But after 20 years on the field, Rory is calling time – along with teammates Sam Baker, Tom Biscaro, Tom Cheshire and Drew Olarenshaw. Sam’s off to explore the world, Tom to pursue further studies, Chesh to live and work overseas and, although we don’t know exactly what Drew’s plans are, we’re pretty sure he’ll approach it with the same unrelenting determination he took to every game he played for the Roys. 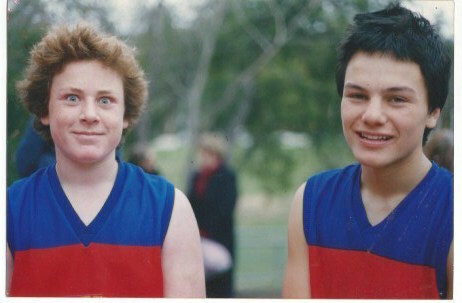 Rory Angiolella started playing for Fitzroy in the under 10s, with Michael Pickering as assistant coach, when he was nine years old. Rory reckons that for the first five years he was the chubby kid they tried to hide in the back pocket (yeah, right). He also says the Fitzroy Football Club has been such a constant presence in his life it’s virtually been a second family to him (easier to believe). Rory has racked up a string of awards along the way (but those of us who’ve seen his game over the years would no doubt say less than he’s deserved). He won the Colts Division 1 best and fairest in 2007 and named BOG in the YJFL Division 1 grand final that same year (and who of us lucky enough to see that game will ever forget it?!). He shared the VAFA’s Under 19 League Best and Fairest with Will Pickering in 2010 and was the GT Moore Medallist for the 2015 season. Then, last year, Rory was named BOG in the Roys’ first senior flag since the Reds and Fitzroy merged in 2008 and the most senior victory in the Club’s amateur history. And that doesn’t even take into account the multiple times he’s made VAFA teams of the year or been runner up in the Redlow and VAFA best and fairest awards, including last season when he was pipped at the post for the L Zachariah Medal, despite missing six games! We all have a favourite Rory moment, but the particular memory for this correspondent is Rory’s response to a player from a (nameless) old school team when he made a homophobic slur to one of ours. Months before Joe Root was universally lauded for doing the same, Rory loudly suggested the sledger come up with a more intelligent insult, reminding him that in post-plebiscite Australia, such comments are dumb and dated. So far this year Rory has turned his efforts to starting a new career as a fire fighter. Currently undertaking 20 weeks’ training, Rory reckons it’s been a fantastic new challenge but, unfortunately, means he won’t be able to play this season. But doesn’t mean that he’ll be a stranger to his legion of fans. “I’ll be coming down to BSO any chance I can to enjoy a Kerry Burger and to soak up the atmosphere as a supporter,” he says. “Michael Pickering has been involved in my life, and not just in my football, for as long as I can remember, as a strong role model and someone I’ll always be grateful to for his guidance and support. “During my time in the Under 19s Tim Bell taught me the benefits of a good work ethic and the importance of training hard on the track. “Simon Taylor and Michael Wallis stand out as two people who taught me about what it means to play at a community club and I also learnt so much from them about how to play football. Finally, Rory says it's awesome to now see Luke Mahoney at the helm. “He's definitely the right man to take this club where it's never been before,” Rory says, “and he truly belongs”. Rory also gives recognition to Fitzroy’s prominent strong female role models he believes are unique to Fitzroy. “The work Sharon Torney does is incredible, along with our leader of so many years, our president Joan Eddy. “I'm proud to have been involved with Fitzroy for so long. There really is no other place like it on earth, from the supporters who turn up week in week out and tell us we are incredible when we feel like crap, to the volunteers like Dave Barnes who give up their free time to make game day possible, and to all the players who have grown up in the area or just found their way down to the BSO. 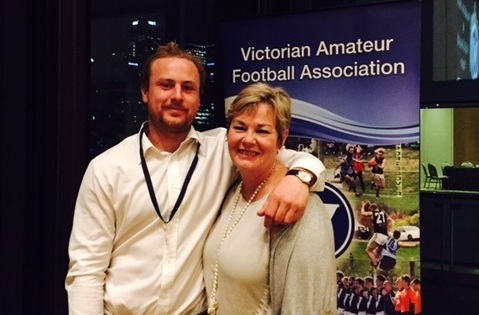 With thanks to Phyllis Queally and VAFA photographers.